In the northeast corner of Arizona and bordering states lies the 27,425 square mile vast desert expanse of the Navajo and Hopi Reservations. The beautiful sunsets here mask the hopelessness, alcoholism, and drug addiction so widespread among the population. Hardest hit are the native Indian children born with alcohol and drug related disabilities whose very lives lack the basic needs of nutrition, clothing, medical care, and love. As former missionaries to the Philippines, Japan, and Mexico, we just could not stand idly by. We now live and work in the small town of Flagstaff, Arizona on the outskirts of the reservation. Here we are the principals of Somebody Cares Native American Outreach, a 501(c)(3) non-profit Christian charity that seeks to save some of the neediest of these children. Over the past few years we have taken nearly a dozen Navajo and Hopi children into our home and away from a hopeless existence. 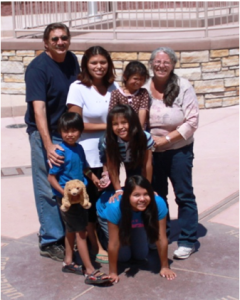 We were the first non-Indian parents permitted to adopt a Navajo brother and sister from a fatherless family of 8 children born to a drug addicted mother. We have been legal guardians to most of the other children under our care. We wish we could serve them all, each and every child, but we can barely support those we have. And many more children desperately need help. Funding for this effort has been extremely scarce. We currently work full time operating the non-profit Somebody Cares Thrift Store set up for the purpose of helping needy and neglected Native children, however, income from this effort is minimal. Any positive contribution at all is only possible due to the efforts of our blessed unpaid volunteer workers. Our current needs are great. We receive no money from any government or Native American organization in support of this effort and rely entirely upon the goodwill of a handful of supporters. We provide personal loving care to abandoned children by bringing them into our positive Christian family environment. More children are out there in great need and the weight upon our hearts is heavy. We have only one alternative to turn to for help. Only our brothers and sisters in Christ can help us move forward and meet this desperate need. We are at an age that most people retire but instead will continue to serve the needs of the children in our care, and even more to come, for as long as God gives us the strength and means to do so. We realize that the need for resources is great from many worthy causes but as our Lord commanded in Matthew 19:14, Mark 10:13-15, and Luke 18:16, “… suffer the little children to come unto me.” The truth is that the only way these children can come unto their Lord is with your help. Will you help support our missionary effort? We are desperately seeking financial support to keep our doors open to the children, the support that only you can offer. Will your church approve a small monthly gift to help us in this critical work? Will you help give lost and hopeless children the opportunity to thrive? This summer we will be traveling across the country with the children and hope to visit supporting churches along the way. Can you become one of those stops to share a loving hug and a smile from these beautiful faces? As our supporter we would love to send you our monthly newsletter and make you a part of our family. And even if your church cannot help directly would you please share this letter with your congregation or post it on your bulletin board so that the church body may have the opportunity to help if our Lord moves them to do so. And as a 501(c)(3) all contributions are tax deductible. We pray daily for strength and for guidance to continue our work. And we pray earnestly for your support. Without your help our work may be forced to come to an end and more children will be lost. Please help. We ask for your prayers and thank you in advance for both those prayers and any assistance that you may choose to offer. I (we) offer the following gift to Somebody Cares Native American Outreach to help fund the very life, safety, and welfare of at-of at-risk Native American children. or a $___________ missionary sponsorship payable to Somebody Cares. You may also make a safe and secure contribution online by clicking the donate button on right. From the bottom of our hearts we and the children thank you for your support.